Probably the most frequently uttered words from my mouth over the last 15 years have been, Inhale, let your belly rise. Exhale, let your belly fall. I speak those words multiple times daily when I teach Yoga, and for the last ten years, I have used them in a bedtime ritual for my daughter Lucia. Last week my family went to New Orleans for my partner Nancy's father's 75th birthday celebration. Their big Sicilan family had multiple parties including an all-day craw fish boil, a wine soaked, rich, meaty meal at an Argentinian steak house, and a 30 person celebration for St. Joseph's Day where we all ate way too much Pasta con le Sarde. Usually we stay in New Orleans, in the French Quarter or the Garden District, but this time we stayed at Nancy's brother's new house in Mandeville which is on the North Shore. For those of you who've never been to New Orleans, The North and South Shores are separated by Lake Pontchartrain. The way to get from one shore to the other is via the Causeway Bridge, which is 25 miles long. On our fourth day in New Orleans, after four days of too much rich food and drink, we headed back over the Causeway to the south shore for one last party before our evening flight back to Seattle. Nancy drove and her brother Billy sat in front. 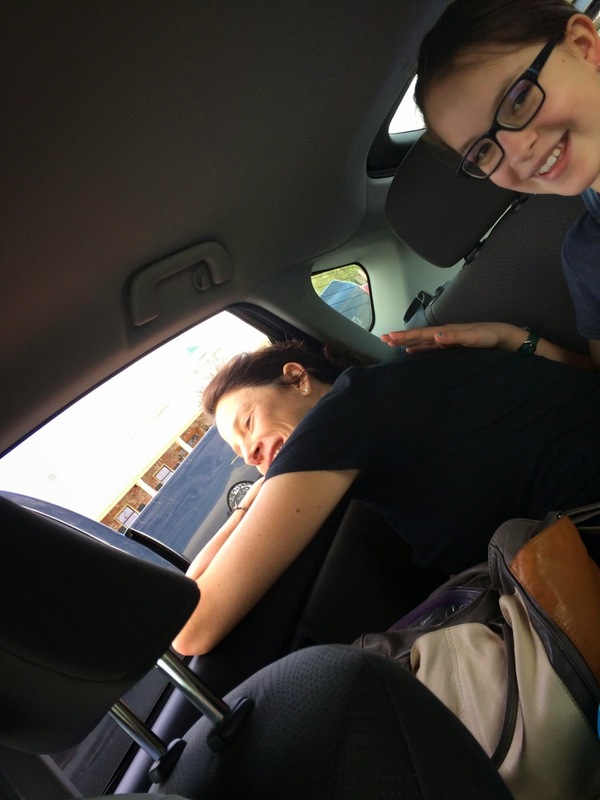 I hunkered down in the back seat with the ten year olds--Lucia and her cousin Kaye. From a young age, I have always been prone to motion sickness-- cars, boats, planes-- I don't do well, and back seats are never a great idea for me, but there was no way I was going to squeeze Big Billy into the back seat of our mid-sized rental. I'm really used to getting car sick. Nancy and Lucia have a hilarious imitation of my deep breathing, eyes closed technique that I regularly employ on turbulent take-offs and landings. The Causeway is one straight line with ritual bumping for 25 straight miles. By the time we reached land, my head was hanging out of the back seat window like a hound dog, eyes closed, hair blowing. While Nancy and Billy chuckled good-naturedly in the front seat about my sorry situation, Lucia took matters into her own hands. On this last stretch of the drive, I felt Lucia patting my back, "Inhale, let your belly rise. Exhale, let your belly fall", she said over and over as she patted my back. She spoke very softly and it was hard at first with the wind blowing in my ears to hear what she was saying, but then I heard her clearly. Oh yeah!!! My breath. I can use my breath to get through this drive. And so I did. As we drove those last few miles, I listened to Lucia's voice, felt her little hand patting my back, and focused on those two things. Before I knew it, we'd arrived at Nancy's parents' house on the South Shore, ready for one more party!